This is an expanded version of the game of the same name from Clouds on the Clothesline, a Canadian publication. Divide players into teams. Place one chair in front of each team, and one chair behind each team. 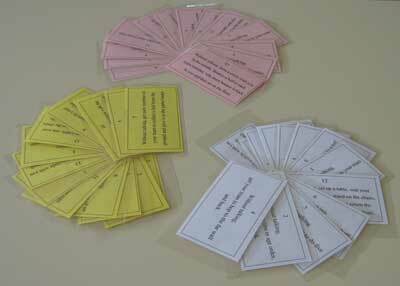 On the front chair, place a number of cards with secret orders written on them. Tell players that each team has a set of Secret Orders to fill—in silence. In turn, each player runs from the starting point to her player’s chair, where she picks up a card, reads the order, and then fills the order. The second team member then runs up, picks up the next order, and fills the order, etc. After each order is complete, the person who picked up the card jumps up and down on the spot five times OR gives an Indian war whoop (to signify it is complete), and puts the card on the chair at the back of the team. The first team to complete all the orders wins. Each team member must walk the length of the hall balancing a book on her head (no touching!) If the book falls off, she must start again. Without talking, set up a table, seat your team around it on chairs, stand on the chairs, shout GUIDES ROCK!, then return the chairs and tables to where they came from. Without talking, form a circle with you in the middle. Bounce a ball to each team member, who must bounce it back to you and then sit on the floor. In practice, my girls tended to jump up and down five times rather than give out a war whoop. I'm not sure why. Possibly because the rest of the game was supposed to be in silence. Anyway, since most of the girls simply followed the leader, we had a lot of girls jumping up and down five times, not realising that was the signal to show the end of the activity. The girls absolutely loved this game, and, although it was not stated at the beginning that it was a race, they treated it as one. They had a ball. If you have any suggestions for further activities to include in this game, please email me.